The Société de transport de Montréal (STM) allows OPUS cardholders to register their cards online so that any remaining fares may be recovered in case of lost or stolen cards. Unfortunately, from a security standpoint, the system is flawed in a number of important ways. Customers are sent to this website to register their OPUS cards. It uses SSL so data should be protected in transit. So far, so good. A domain-validated certificate is fairly easy to obtain since it only requires that the applicant prove they have access to the domain (in this case, contactstm.info). This can be as simple as uploading a unique file to a website hosted under that domain to satisfy this requirement. It’s probably safe to assume this is the company that developed this website, but the optics are not good. Not only is there no information to conclusively link this website with the STM, worse, it sure feels like my personal information—you are asked for your full name, personal questions presumably used to validate you in the future, postal code, birthdate, and a photo of your OPUS card—is being submitted to a marketing company. The fact that the STM relies on a domain-validated certificate provides no guarantee that the certificate was actually obtained by the STM. A phisher could easily register a domain like registerstm.info, set up a website under that domain, then either get the same RapidSSL domain-validated certificate that the STM uses here or get a free SSL certificate via LetsEncrypt. Throw a few STM logos on the website and profit from users tricked into giving away their personal information. That the STM’s own websites don’t provide any assurances about their relationship to the STM only confuses matters further for those who want to verify whether they’re actually sending their information to the STM or some 400-pound dude. WHOIS info for stm.info shows a private registration at GoDaddy, making it impossible to validate whether this domain actually belongs to the STM. Hint: If you want to keep registration details private, do something like the NYC MTA which at least lists its official name as part of the domain registration; however, to be fair, its website also suffers from the same allergy to SSL as the STM’s. Fortunately, fixing these problems is not necessarily complicated or particularly time consuming. Not all sites require more than a domain-validated certificate (this site, for example, uses such a certificate), but if you’re going to collect personal details of any sort, a domain validation certificate isn’t enough. The easiest way to resolve the issue with the contactstm.info website is to get an extended validation (EV) certificate. These types of certificates currently provide the highest level of assurance that you are dealing with a legitimate business entity. As an organization, getting an EV certificate typically requires submitting supporting documentation (articles of incorporation, proof of business registration, etc.) as well as fielding a phone call from the issuer to a published phone number belonging to the organization. 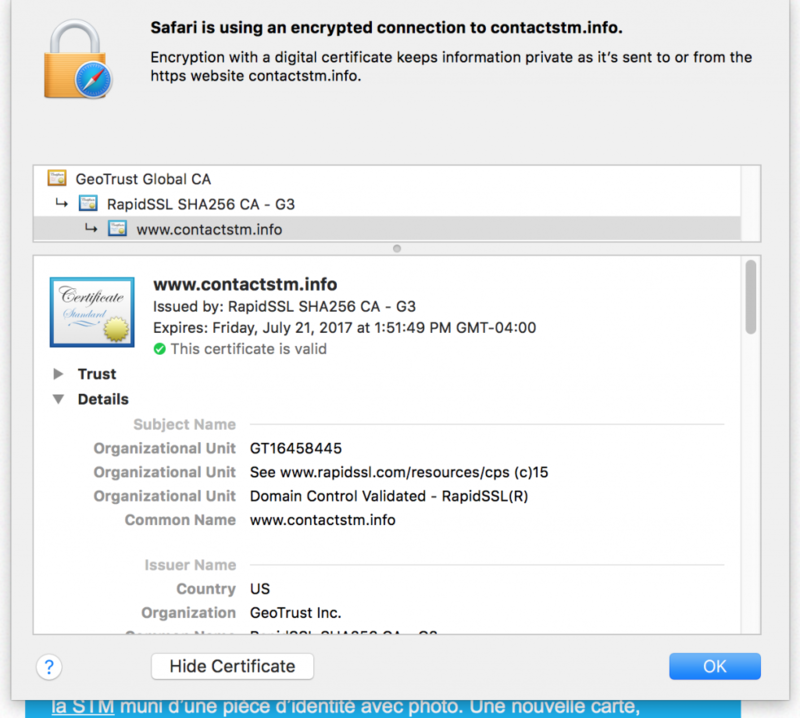 As a user, you’ll typically recognize these types of certificates by the name of the organization in green in your browser’s location bar next to a padlock icon or some other symbol indicating that the site is secured using SSL. Even an organization-validated certificate would be better than a simple domain-validated certificate. But considering the STM is a public corporation and they are collecting personal information, an EV certificate would be preferable and its increased cost is negligible. Make sure to include some reference to the STM in all of their domain name registrations. Don’t rely on private registrations that mask any relationships between the STM and the domain names it operates. Doing so significantly reduces users’ confidence that they are dealing with the real thing while increasing the chances that thieves can set up lookalike sites to successfully steal information from unsuspecting users. In addition, they could host all of these micro-sites on stm.info subdomains, like opus.stm.info, which would arguably be a better solution than registering unique domain names. There is precious little information on this website regarding how your personal information is used, what laws govern data collection, etc. until you’ve actually submitted your information. This kind of information needs to be prominent and available to users before they commit to uploading their personal information. Hopefully, these issues will be addressed sooner rather than later. The solutions are simple but can go a long way to improving their current setup.